Zombie titles really need to innovate more-so than a lot of other types of games these days. The market is just so saturated that the mere notion of “survival" itself just isn’t enough, and there at least needs to be an interesting hook involved beyond the solitary concept of continuing to exist. Skyhill ($2.99) does that, even if the magic doesn’t last as long as the developers intended it to. Okay so the creatures in Skyhill aren’t traditional zombies (they’re more like mutants), but it’s close enough. After waking up at the top of a 100 floor hotel 28 Days Later style, your job is to get to the bottom and escape after your supplies are low. Enter the aforementioned interesting idea mixed with a side order of roguelike. Slowly but surely you’ll make your way to the bottom, forging your own story in the process and constantly doing battle. You might only make it several floors before getting worn out, with no food left, and no items, so be warned if you’re not into that kind of challenge. Yes, even though you can alter the difficulty level, it’s an all or nothing deal. You’ll get a randomized layout, complete with random enemy placements and items, which can either facilitate or hinder your goal. If you die, it’s all over and you’ll start again at the top. 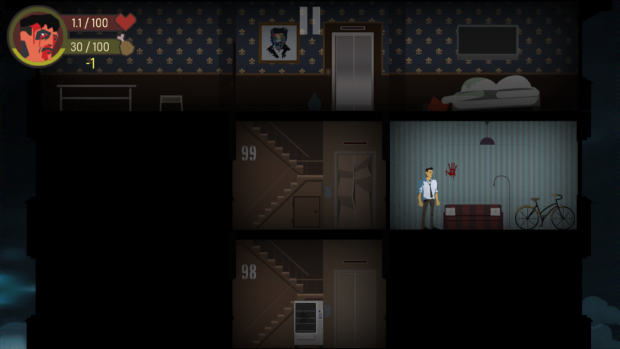 Somehow even with its gamey art style, Skyhill manages to be unsettling. It creates a compelling enough apocalyptic world even though the only bit you can see is a hotel. The mutants are sufficiently disgusting, and the dark setting of the building and the notion of randomness adds tension. Movement is also a resource. Going into a zone costs a unit of food (which, when depleted, starts hacking away at your health), regardless of what you find. In other words you could come across a treasure trove of items after fighting off optional enemies or an empty room. Even with situations that involved the latter I was hard pressed to call it “annoying." Combat takes a similarly smooth approach. When fighting ghouls you have the option to go for a strong but wildly inaccurate strike, a balanced attack, or a weak but precise swing. It’s a consistently nerve wracking choice from beginning to end in any given confrontation, as you can go for broke and topple an enemy in seconds, or completely miss with the same brutal chain of attacks. Fights change on a dime too, as different enemy types and new weapons enter the picture. Even though the scheme is akin to an old school Telnet system it doesn’t get old, and the fact that it plays out so gracefully on a touch screen doesn’t hurt. The same goes for tapping to move from room to room or floor to floor. 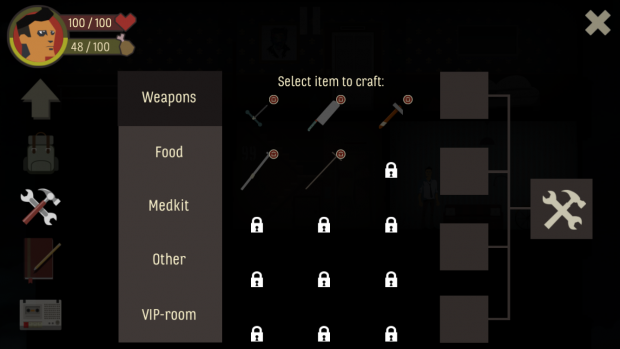 Finding new gear can be a rush, but there’s also a crafting system that involves creating new tools and food. It’s a tiny thing, but it makes every pickup pertinent. Whereas a small find like a muffin or a wrench might be a useless pickup in another game, Skyhill encourages exploration. But as thrilling as runs can be, they can feel equally dull. The roguelike shtick is random in theory but sometimes Skyhill‘s runs are just too similar. Several mechanics like repairing the main elevator to go back to the top to recuperate are neat, but there needs to be more of that. More meta cross playthrough concepts would help elevate round to round sessions. A strict adherence to the roguelike formula can be fine at times, but when you’ve basically shown your hand after an hour or so there’s an issue. It’s great that on iOS at least you can get a few floors in here and there in a run, and that the premium purchase ensures that you’re not getting nickel and dimed with power-ups and balances towards microtransactions though. Once you’ve played through Skyhill, you’ve seen basically everything you need to see. In fact, the same criticism could be levied even if you’ve only experienced half of it, since there just isn’t much here in general to fiddle around with after you’ve picked up the gist of the crafting system. But since the atmosphere and gimmick are so well implemented, that alone makes this a zombie survival game worth checking out.